This Flevo-variant of Andreas Leutz has a different rear suspension: A pneumatic gas cylinder. You can see it diagonally under the rear fork. The gas cylinder is connected to a pressure reservoir behind the seat. 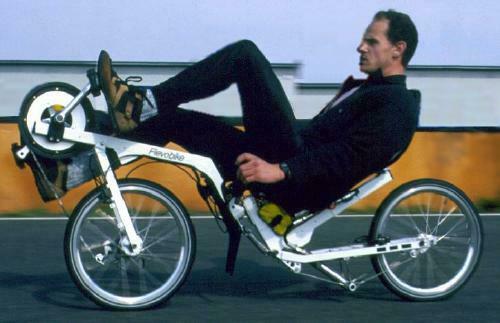 On the picture, the bike is at it utmost recumbent position, but with one push on a button it can be tilted more upright. This unnamed bike with Flevo-like steering can be moved up and down while riding. 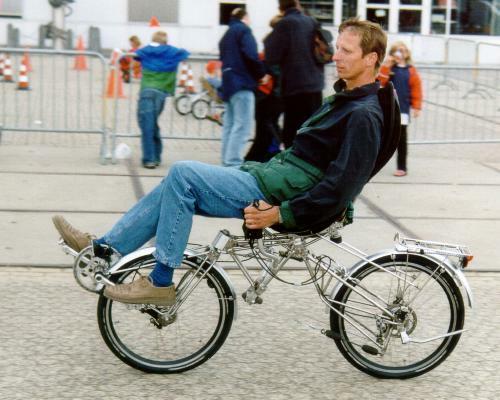 This way, the rider can change between a pretty upright and a recumbent posture. The rear wheel contains a modificated 7 gear hub, with some 3 speed hub parts in it. Under the frame is a steel cable which is wound around a drum. This drum has replaced the chain gear-wheel of the rear hub. A handle can switch the rear hub in such a way that the steel cable can be wound or unwound. This mechanism is powered by the riding rear wheel.